PPSC Recruitment 2019: Punjab Public Service Commission has released the official notification for the 34 vacancies of Senior Assistant. Eligible and skilled candidates are able to send Punjab Public Service Commission Jobs 2019 Application Form through the Online mode from its official website ppsc.gov.in. Interested Candidates may Apply Online for PPSC Senior Assistant Vacancy 2019 till the last date which is 20-02-2019. Candidates can download the official notification from official website before applying for this vacancy. 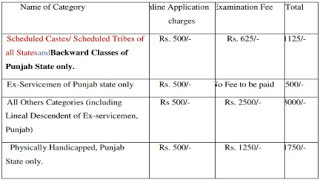 To get more information regarding the Punjab Public Service Commission Recruitment like eligibility details like education qualification, age limit, selection process, application fee & how to apply, important links, syllabus, admit cards, results, previous papers are given Below. Selected candidates will get Rs. 10,300 – 34,800/- With 4400/- Grade Pay from the organization. Look around for “PPSC Recruitment 2019 for Senior Assistant Posts“.